the most stability when entering and exiting your truck and possibly prevent injuries. Before doing anything else, make sure your hands are empty. If entering the truck, put your items in the truck before starting your ascent. If you are exiting the truck, place your items where you can easily reach them AFTER you are completely out of the truck. This could be on the seat or the floor, depending on your reach. Whether coming or going, always make sure your items are somewhere you won’t trip over them. Once your hands are empty, use the 3-Point Stance to enter or exit your truck. This means keeping at least 3 points of contact with your truck at all times: both hands on the doorframe and at least one foot on the steps. There are 2 bars on the inside of each truck doorframe. Grab both of these bars as you move in and out of the truck. They give you more stability than grabbing the door or the frame itself. They also help prev ent slipping or possibly falling off the steps. Accident prevention starts with the basics. 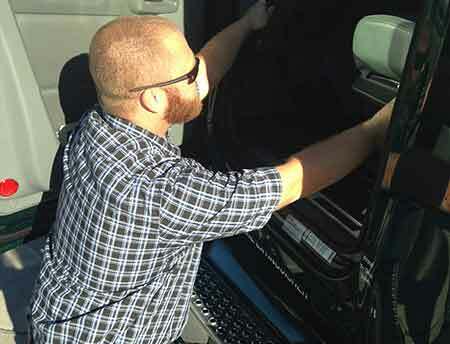 For a truck driver, one of the basics start with knowing how to move in and out of the truck. Using the 3-Point Stance is a step towards safety.